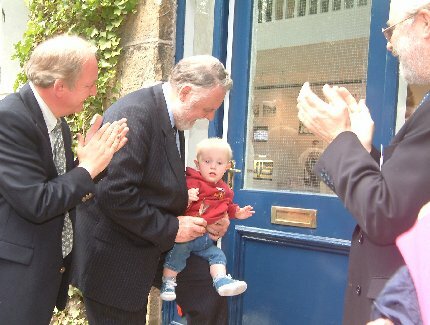 The all new Bollington Discovery Centre at Clarence Mill was opened for visitors on Saturday afternoon, 14th May 2005, by our special guests, cousins John and Terry Waite. A crowd of more than 200 guests stood in wonderful warm spring sunshine and heard an introduction from Civic Society Chairman, Tim Boddington, followed by very amusing but thoughtful speeches from John and Terry. Terry then invited the youngest member of the audience to join him in cutting the ribbon. This turned out to be young Sam Hibbert who was most surprised to find himself the focus of so much attention. Nevertheless he was impeccably behaved as he assisted Terry and John in the cutting of the ribbon and declaring the Discovery Centre open! John & Terry arrived at Clarence Mill in style, driven by Bob Vass in his immaculate 1930 Rolls Royce. Waiting for them was a Guard of Honour provided by the Bollington Sea Cadets from Training Ship Ardent at Adelphi Wharf. During the afternoon other cadets demonstrated their canoeing skills in the canal in front of the mill. Once the ribbon had been cut the invited guests were shown around the Discovery Centre before going to the old Toads restaurant at the end of the yard to enjoy a cup of tea and see further displays provided by the Civic Society and the Macclesfield Canal Society . John and Terry spent the afternoon talking to guests who included 85 year old Joyce Colley, nee Jackson, who was a friend of Terry’s mother and had pushed him around Bollington in his pram all those years ago! Later Terry went to see the house in Coronation Buildings where his father, a local policeman, had lodged before his marriage, and then to the house in Wellington Road where he was born. Occupied today by Mathew and Carolyn Scott-Patrick, this was a particular thrill for Terry, it being the first time he had seen the house of his birth since his family left Bollington when he was an infant. Meanwhile John paid a visit to our very own Canalside Community Radio and was interviewed on the spot! Terry also paid a visit to Canalside Community Radio on Sunday morning to be interviewed by Nick Wright before going to St. Oswald’s Church at Bollington Cross for morning service, where he read one of the lessons. This was also a special experience for Terry as he had been baptised at St. Oswald’s back in 1939.